Chester FC Community Trust have a host of Easter fun lined up for the school holidays with Soccer Schools and Futsal Camps for football crazy youngsters. Following a successful holiday programme during the February half-term, parents can now book places for boys & girls to take part in two weeks of activities with FA qualified coaches and the Trust offers online booking through Eventbrite (additional booking fee applies) at community.chesterfc.com/book-online. Each day costs only £10 and runs from 10am until 4pm with an optional 9am early drop-off available for £2.50. Children will need a packed lunch, snacks, lots of drinks as well as suitable footwear, shin pads and appropriate clothing. 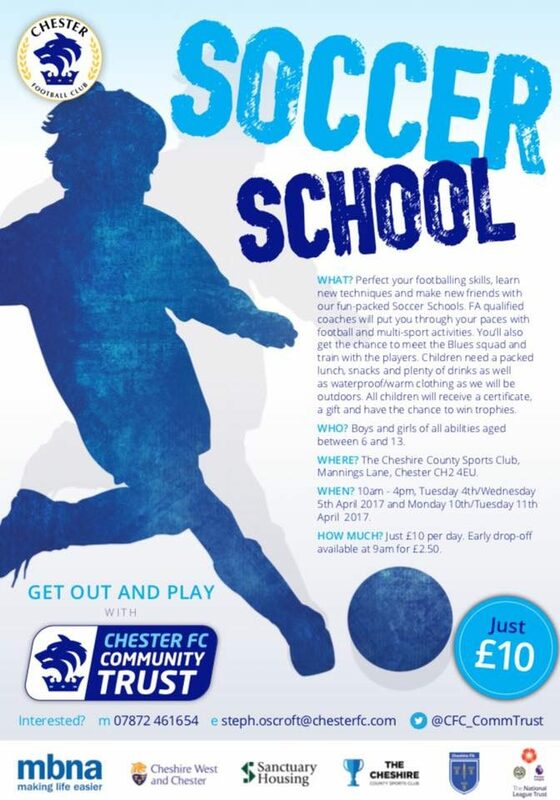 The ever popular Chester FC Soccer School is again held at The Cheshire County Sports Club and will run on Tuesday April 3rd, Wednesday April 4th, Monday April 10th and Tuesday April 11th. Children will be able to perfect their skills, pick up tips and develop techniques through drills and games, and make friends through fun sessions. 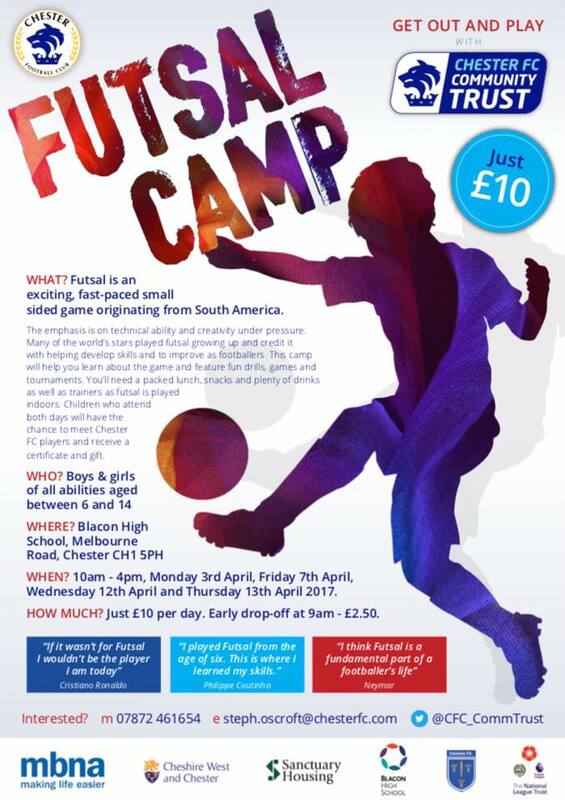 The Chester FC Futsal Camp returns to Blacon High School on Monday April 3rd, Friday April 7th, Wednesday April 12th and Thursday April 13th after proving a huge hit on its launch in February. Children can experience the exciting and fast-paced small-sided game that the likes of Lionel Messi, Cristiano Ronaldo and Coutinho played as youngsters. The camp will feature skills sessions and tournaments including a Champions League and World Cup. All participants will receive a certificate and gift – and there will be opportunities to meet Jon McCarthy and members of his squad. Places can be booked online (additional booking fee applies) at community.chesterfc.com/book-online, on 07512 355396 or via community@chesterfc.com. 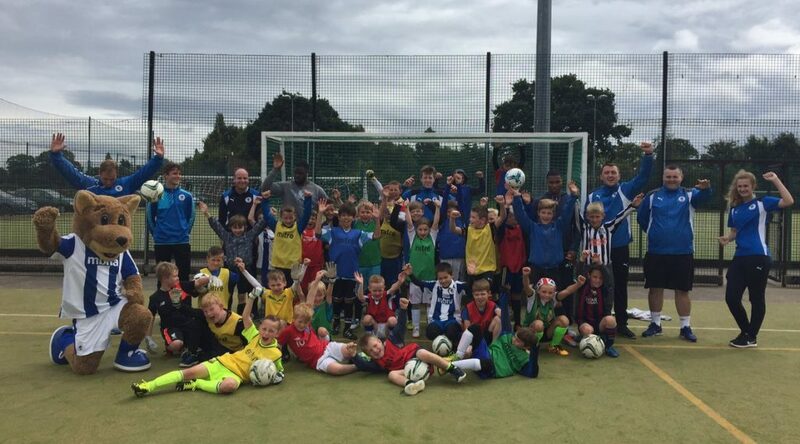 Jim Green, chief executive of Chester FC Community Trust, said: “We had a brilliant time at our February holiday activities and we’ve got another packed programme for Easter with eight days of coaching to keep youngsters entertained and on the move. “The feedback from children and parents in February was extremely positive and our coaches plan sessions to ensure they help players improve their game while having lots of fun. It’s great to see so many children keeping active during the holidays and making new friends. Tattenhall Park Primary School is a step closer to playing at Wembley Stadium after being crowned Chester’s champions of the inaugural National League Trust Under 11s Cup. 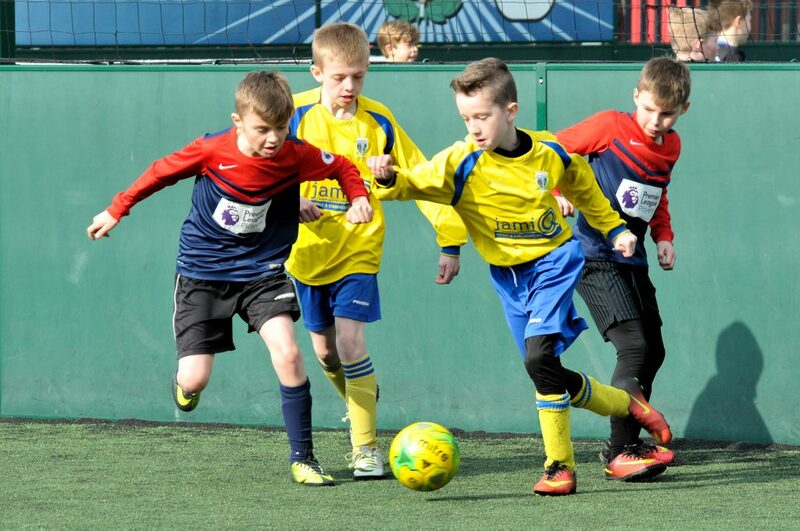 Primary schools across the country have been competing at tournaments run by 40 National League clubs and the winners will now meet in regional competitions to decide the four schools who will have the once-in-a-lifetime experience of playing at Wembley on Sunday, May 14. 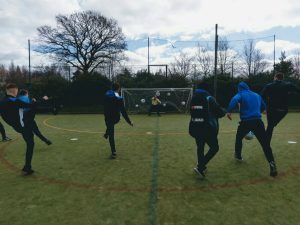 Chester FC Community Trust worked with CEPD Chester and Footgolf Chester to stage an action-packed tournament at Goals Soccer Centre on Thursday afternoon with 19 teams of boys and girls representing schools from across Chester taking part. Games in the group stages were extremely competitive and played in an excellent spirit with an extremely high standard of football on show, earning praise from teachers, parents and organisers. The top two teams in each of the four groups progressed to the knockout stages with Cherry Grove, Hoole, St Clare’s, St Oswald’s, St Werburgh’s & St Columba’s, Tarporley, Tarvin and Tattenhall Park battling it out in the quarter-finals. In the semi-finals Tarvin overcame St Oswald’s and Tattenhall Park edged out Tarporley to book their place in the final. The deciding game lived up to the billing with both teams producing fantastic performances in a see-saw contest that eventually finished 4-3 in favour of Tattenhall Park, who will now represent Chester FC against the winners from clubs including Tranmere Rovers and Macclesfield Town in the North West regional final at Stockport County on March 28. 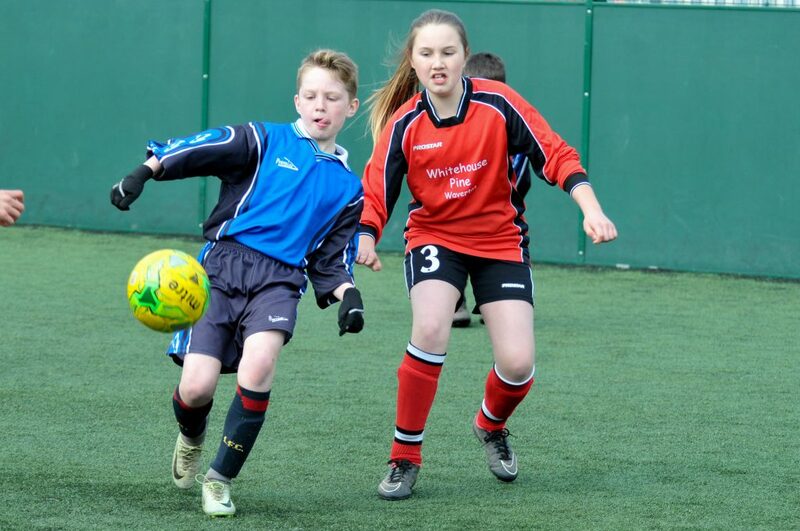 Jim Green, chief executive of Chester FC Community Trust, said: “It was a brilliant ternoon and every school that took part should be very proud of their pupils for upholding the values of fair play and respect and contributing to such a competitive tournament. 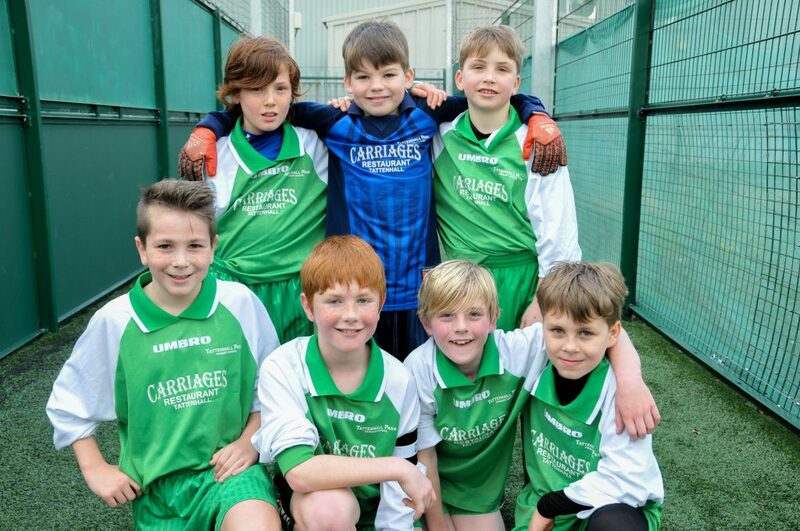 “Tattenhall Park proved worthy winners and we look forward to supporting them as they represent Chester FC in the regional final at Stockport and hopefully onto the national final. The prospect of playing at Wembley Stadium is an incredible opportunity for these young footballers and we wish them the best of luck. Blues fans are reminded this evening’s match between Chester FC and Macclesfield Town is a special Memories Game. The club will be paying tribute to supporter Garry Allen, who had a strong connection with Macclesfield, before the game and recognising it is 25 years since Chester City returned from exile at Moss Rose. 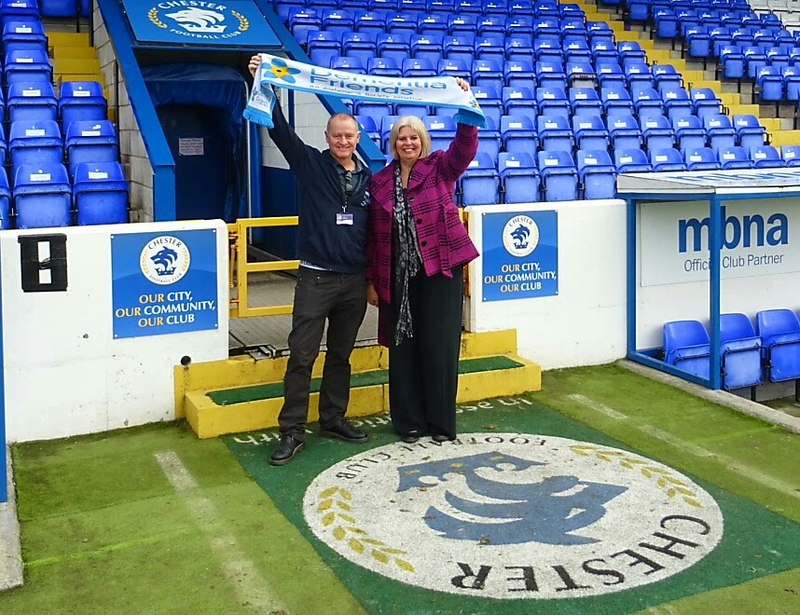 Andy Tysoe and Sandie Williams, co-chairs of West Cheshire Dementia Action Alliance, have worked with Jim Green, chief executive of Chester FC Community Trust, and the Sporting Memories Foundation to encourage supporters to celebrate the heritage of the club and raise awareness of dementia. A special edition of The Cestrian match programme will be on sale and prior to the game fans can reminisce over a memories display in the Blues Bar illustrating the club’s time in Macclesfield and talk to representatives from West Cheshire Dementia Action Alliance. At half-time a number of familiar faces who served the club during its period in exile will be introduced to the crowd including Ray Crofts, Joe Hinnigan, Chris Lightfoot, Eddie Bishop and Roger Preece before Graham Abel, who made over 300 appearances for the club between 1985 and 1993, is inducted into the Chester FC Hall of Fame. Andy Tysoe, who works as a dementia nurse at the Countess of Chester Hospital and is a national campaigner, said: “Dementia is not just an issue for health and social care – everyone needs to know about it and how we can help support people. “It can affect anyone – including footballers and their fans, families and friends, irrespective of who they support so we all need to work together to make it better for people with dementia and their carers. Using football and sport as a way of promoting communication and interaction can make a real difference. 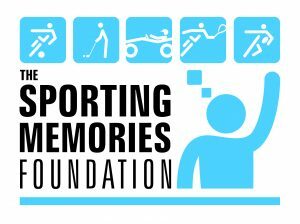 The Sporting Memories Foundation works with partner organisations to help support older people continue to enjoy sharing memories of their lives as fans or indeed players. A grant from The Big Lottery Fund has seen new weekly sporting memories groups start in the North. If you would like to get involved, either as a volunteer or group member, visit www.sportingmemoriesnetwork.com. Dementia is a brain disease, not a mental illness and not a natural part of growing old. There are many different types: Alzheimer’s disease and Vascular Dementia being the most common. An estimated 850,000 people live with Dementia in the UK. Dementia is not just about memory loss, it can affect reasoning, communication and movement. People with dementia can continue to enjoy sports, new activities and contribute to their community. If you are concerned about your memory, talk to your doctor sooner rather than later. Next week’s game between Chester FC and Macclesfield Town will be an emotional occasion full of memories for more than one reason. Firstly the club will pay tribute to supporter Garry Allen who so sadly passed away at the Tranmere fixture and secondly recognise it is 25 years since the Blues returned home after two seasons exiled at Moss Rose, something that is especially pertinent as Garry had strong links with Macclesfield with members of his family even working at the club. It is perhaps appropriate the fixture on Tuesday, March 21 has been designated a Sporting Memories Game in partnership with Chester FC Community Trust, Chester Former Players’ Association and the Sporting Memories Foundation, a charity that uses the heritage of sport to support older people living with dementia, depression and loneliness. Alan Tarbuck, chairman of Chester Former Players’ Association, said: “It will be an emotional evening on Tuesday as the Chester FC family remembers Garry and shows his family and friends our love and support. “We had identified the match against Macclesfield as an opportunity to recognise the fact it is 25 years since the club returned home while also helping to raise awareness of dementia with the Sporting Memories Foundation, and when we learned of Garry’s own personal connection to Macclesfield it seemed even more fitting. Following the sale of the Sealand Road stadium, Chester City were forced to find a new home and eventually reached an agreement to groundshare with Macclesfield Town, some 40 miles away. The move to Moss Rose meant supporters had to undertake an 80-mile round trip for ‘home’ games with the Club organising a fleet of double-decker buses to transport fans across Cheshire. 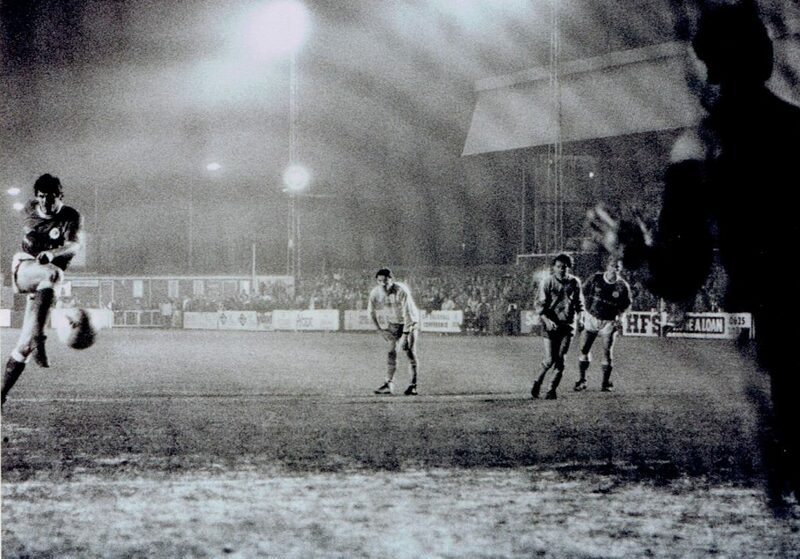 Despite an inevitable drop in crowds and being among the favourites for the drop, Harry McNally’s Blues defied the odds to avoid relegation from the old Third Division before returning home to Chester in 1992 following construction of the Deva Stadium. Now 25 years later, the Sporting Memories Game aims to celebrate the club’s heritage and encourage fans to share memories while raising awareness of dementia. To mark the occasion, the Former Players’ Association will be inducting Graham Abel, a stalwart of the team that played at Moss Rose who made over 300 appearances for the club between 1985 and 1993, into the Chester FC Hall of Fame. A number of familiar faces who represented the club during its period in exile will also be attending the match including former chairman Ray Crofts and players Chris Lightfoot, Eddie Bishop and Roger Preece with more pending confirmation. There will be a special edition of The Cestrian match programme including a commemorative cover and features looking back at the club’s tenure at Moss Rose, and match tickets, programmes and photographs from the time will feature on a memories display in the Blues Bar allowing fans to reminisce. Supporters are encouraged to get involved too and recall their own memories of following the Blues during the club’s time in Macclesfield be it the League Cup clash with Arsenal in front of more than 4,000 or being among the 409 hardy spectators who witnessed a 2-0 win against Bury in the Leyland DAF Cup. Fans can share their personal memories on social media using the #MaccMemories hashtag and will also be able to log them using the free ‘Replay Sporting Memories’ app while organisers are also keen to hear from anyone who has items from the period in exile such as shirts or photographs which would be of interest to fellow supporters. For further information about the Sporting Memories Game email community@chesterfc.com. Girls in Chester will be provided with increased opportunities to play football as part of a new nationwide participation programme. Chester FC Community Trust is launching two SSE Wildcats Girls’ Football Clubs in partnership with Cheshire FA. The programme will see 200 SSE Wildcats Girls’ Football Clubs opening throughout England this spring and is an integral part of The FA’s objective to double girls’ football participation by 2020. The move will provide girls aged from 5 to 11 with regular opportunities to play football and take part in organised sessions in a fun, engaging and safe environment. 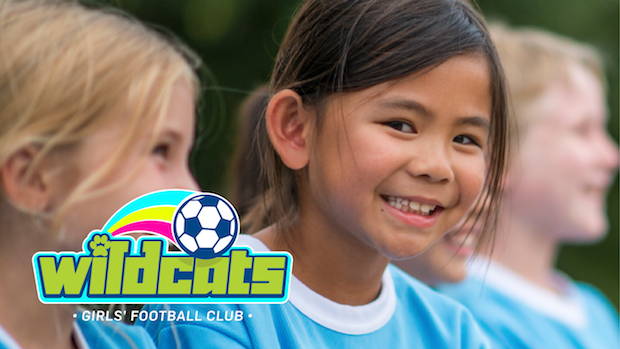 The SSE Wildcats Girls’ Football Clubs will run in the spring and through to the summer on a weekly basis. There will be one based at Goals Soccer Centre on Saturday mornings from 10am until 11am offering mini soccer and one based at the Northgate Arena on Tuesday evenings from 5pm to 6pm offering futsal. The cost is £2 per session and places can be booked via community@chesterfc.com or on 07512 355396. Parents and carers who attend with the girls will also have the optional opportunity to take part in football-related fitness sessions at the same time as the girls. Jim Green, chief executive of Chester FC Community Trust, said: “We’re delighted to be part of this nationwide programme supporting The FA’s plans to double participation in women’s and girls’ football by 2020. 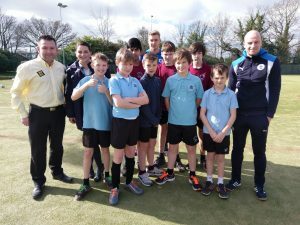 Chester FC staged an impromptu training session with Year 8 students at Upton-by-Chester High School thanks to Big Yellow Self Storage Chester. The students at the school had helped contribute a sizeable amount of gifts and toys for the annual Big Yellow Chester Christmas Toy Appeal, which raised over £10,000 worth of gifts for under privileged and sick children in time for Christmas 2016. Players including Ryan Astles, Sam Hughes and Evan Horwood, as well as Blues boss Jon McCarthy, dropped in to pass on some of the tricks of the trade to the delighted students. Jeff Banks, business development manaager at the Chester store on Sealand Road, wanted to recognise the students at Upton for their efforts and teamed up with the Chester FC Community Trust who then organised for Jon McCarthy’s men to stage a different PE lesson for the students – a live training session to help develop the youngsters skills. Karen Smale, Head of RS at the school, also thanked the club and Big Yellow for delivering the surprise training session. 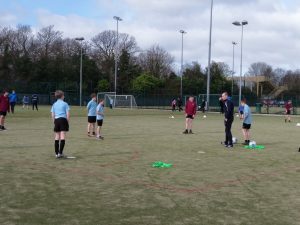 She said: “All the students in Year 8 loved their training session with Chester FC. The Big Yellow Christmas Toy Appeal runs annually and businesses who would like to get involved with the 2017 appeal can contact Jeff Banks by emailing chester@bigyellow.co.uk. Active Cheshire is to form a new and exciting partnership with the Dame Kelly Holmes Trust and Chester FC Community Trust to enhance the lives of young people in and around the City of Chester. ‘Get on Track’ is a flagship community-based programme focusing on personal, social and emotional development for individuals aged 16-25. The programme is led by world-class athletes over a 14-month period aimed to enhance the lives of young people facing disadvantage. The whole programme looks to empower young people to make positive life choices through the realisation of attitudes and behaviours. The programme comprises four stages; On Your Marks, Get Set, Go and Keep in Touch. Throughout the all stages young people will learn to improve their communication, teamwork, resilience, employability skills, confidence and self-belief. As part of the programme the young people will gain qualifications in First Aid, Inclusion and Safeguarding whilst also delivering a ‘Social Action’ project to support local good causes. Chester FC Community Trust will act as the main delivery partner alongside Neil Danns and Henry Cookey who are the athlete mentors from the Dame Kelly Holmes Trust – working specifically on the Cheshire project. The Lookers Vauxhall Stadium on Bumpers lane will play host to many of the sessions over the course of the programme, playing a central role in connecting with young people and providing an aspirational environment. 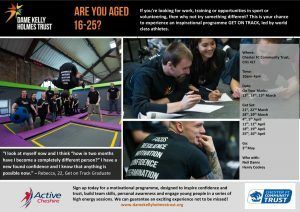 If you are aged 16-25 and looking for work, training or opportunities in sport or volunteering, you can sign up to the programme or find out more by contacting sarah.tilling@activecheshire.org.